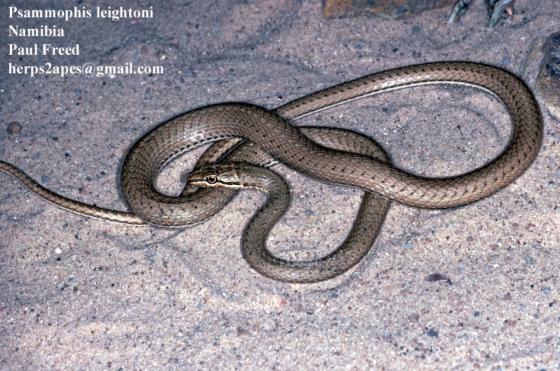 Can you confirm these amateur observations of Psammophis leightoni? Type locality: "Eerste River Station, 21 miles east of Cape Town, Cape Colony." Types Holotype: BMNH 1946.1.8.27, a 910 mm specimen (G. Leighton). Diagnosis Description: (24 specimens examined). Nostril pierced between 3 nasals, upper posterior with a posterior prolongation; preocular 1, in broad contact with frontal; postoculars 2; temporals basically 2+2+3, but with frequent fusions; supralabials 8, fourth & fifth entering orbit; infralabials 10 (rarely 9), the first 4 in contact with anterior sublinguals; dorsal scales in 17-17-13 rows; ventrals 155-169; cloacal shield divided; subcaudals 92-112. Brandstätter (1995, Fig. 45) has published a SEM micrograph of a dorsal scale from NMZB 3570 from the Cape Flats. Dark brown above, top of head with a yellow stripe along the internasal/prefrontal sutures, most of supralabials, pre- and post-oculars yellow, two yellow bars across back of head. Vertebral scale row with a fine yellow line (often broken up), a yellow lateral stripe passes through scale rows 3 & 4 or fourth only, scales in outer row white at base (Broadley 1983, Fig. 84). The “chain pattern” on the side of the neck is illustrated by Boulenger (1902, pl. xii). Chin with a pattern of black streaks, ventrals with a mottled grey median band, widened at the free edge of each ventral and fading posteriorly [from BROADLEY 2002]. Comment Nomenclature: PETERS’ name is a junior homonym of Psammophis furcatus (BIANCONI 1859) = Psammophis punctulatus DUMÉRIL & BIBRON 1854. Taxonomy: Psammophis leightoni trinasalis WERNER 1902 and Psammophis leightoni namibensis BROADLEY 1975 have been elevated to full species status. Distribution: see map in BROADLEY 2002: 89 (Fig. 3).